Pan Pan Thai Cuisine uses their own specialised couriers to deliver their food. Pineapple fried rice with curry powder, chicken, prawn and Thai fish sausage. Roasted duck stir fried with Thai styl spicy sauce, chili jam and basil. Fried fish fillet with sweet and sour sauce and mix vegetables. Slow-braised cooked beef, potato, onion, pineapple, fried onion and cashew nuts. Crispy pork belly with Chinese broccoli and spicy sauce. Spicy crispy pork belly with basil and chilli sauce. Grilled salmon fillet with creamy curry sauce and steamed vegetables. Crispy noodles with mix seafood and Thai style gravy. Spicy fired rice with mix seafood, onion, mushroom and herbs. Deep fried barramundi fish with your choice of sauce; tamarind sauce, sweet and sour chili sauce, hot chilli and basil sauce. Vegetables and glass noodles wrapped in crispy pastry, served with plum sauce. Puff pastry filled with vegetables and curry powder, served with sweet chilli sauce. Deep fried tofu with tasty peanut sauce. Minced fish mixed with Thai curry paste and herbs, served with sweet chilli sauce. Crispy rice paper roll filled with shrimp, crabmeat, fish, taro, garlic and onion, served with plum sauce. Deep fried pork ball, served with sweet chilli sauce. Steam vegetable dumpling, served with soy sauce. Deep fried marinated chicken wing with herbs. Steam prawn dumpling, served with soy sauce. All grill dish with a side of stir fried mix vegetables. Boneless chicken marinated with Thai herbs. Marinated pork collar with Thai herbs. Marinated prime cut of scotch fillet. Marinated mixed of chicken, pork and beef. All fried rice stir fried with egg, shallot and coriander. Onion, tomato and Chinese broccoli. Onion, tomato, carrot, corn and Chinese broccoli. Chilli jam, cahew nuts, onion, tomato, carrots and Chinese broccoli. Fresh chilli, garlic, onion, tomato, corn, basil and Chinese broccoli. Fried rice with spicy and sour curry paste, onion, tomato, corn, carrot and Chinese broccoli following coriander and chopped shallot. All noodles stir fried with egg. Thin rice noodles with tofu, garlic chives, bean sprouts and crushed peanuts. Flat rice noodles with black soy sauce and Chinese broccoli. Flat rice noodles with fresh chilli, garlic, basil, herbs and mixed vegetables. Flat rice noodles with garlic, onion, carrot following coriander and shallot. Flat rice noodles with chilli jam and mixed vegetables. Flat rice noodles with peanut sauce, curry powder and mixed vegetables. Hokkien noodles with egg noodles, garlic, bean sprouts, mix vegetables, coriander and shallots. Rice vermicelli noodles with curry powder, bean sprouts and vegetables. Rice vermicelli noodles with black soy sauce, bean sprouts and vegetables. Rice vermicelli noodles with coconut milk, bean sprouts and vegetables. All stir fries with mix vegetables. Special curry paste and spicy Thai style sauce. Spicy and sour curry paste and Thai herbs. Fresh chilli, garlic, bamboo and basil. Chilli jam sauce topped with cashew nuts. Fresh ginger, coriander and chopped shallot. Peanut sauce and seasonal vegetables. Fresh chilli, garlic, herb and spicy Thai style sauce. Pumpkin, egg, coriander and chopped shallot. Creamy curry paste with coconut milk and mix vegetables. Non-coconut milk with Thai spicy herbs, bamboo shoot and basil. Mild chilli curry paste with coconut milk, bamboo shoots and basil. Authentic curry paste with coconut milk, bamboo shoots and basil. Potato, onion, coconut milk, fried onion and cashew nuts. Tossed with mixed salad, red onion, garlic, chilli, carrot, coriander, shallots and cashew nuts. Tossed with mixed salad, onion, garlic, chilli, carrot, coriander, shallots and cashew nuts. Tossed with red onion, garlic, coconut milk, chilli jam, pineapple, coriander, shallots and cashew nuts. 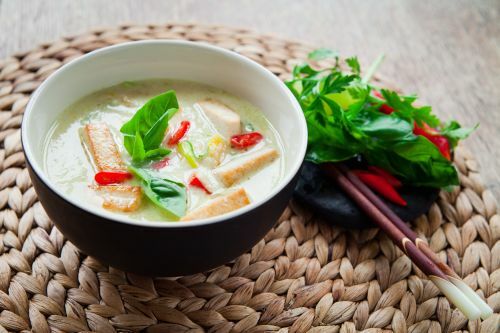 Thai style soup with garlic, coriander and shallots. Spicy and sour soup seasoned with herbs, tomato, mushroom, red onion, coriander and shallots. Spicy seafood soup with lemon grass, kaffir lime leaves, tomato, mushroom, red onion, basil, coriander and chopped shallots.